Every butterfly possesses labial palps (or palpi) - a pair of hairy, moustache-like scaly appendages on the head of the butterfly. These palps are covered with sensory hairs and are believed to help a butterfly "taste" food sources and identify what is potentially edible and what is not. 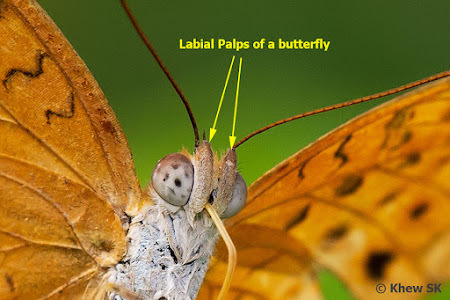 The labial palps are multi-segmented external organs and vary in size and shape across the different families of butterflies. There are also other theories that suggest that the labial palps of a butterfly serves other functions. 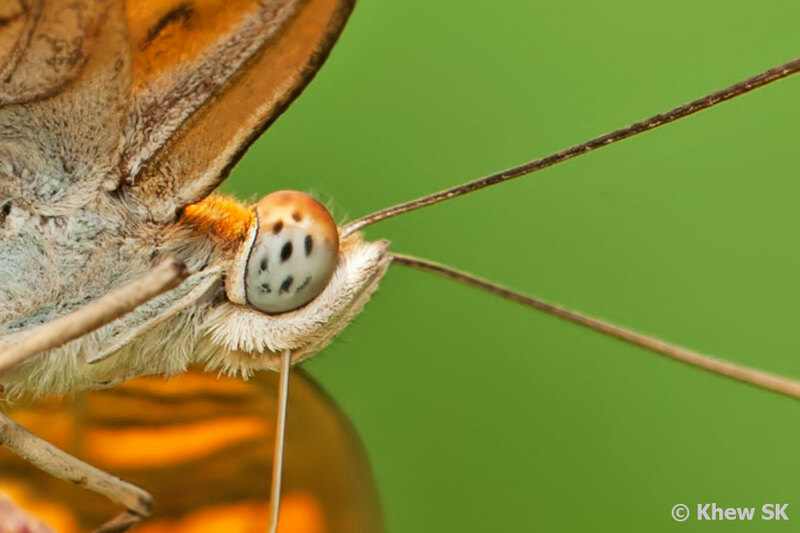 For example, one theory suggests that the pair of palps, given their symmetrical location on both sides of the proboscis, could offer some form of physical protection for the proboscis. 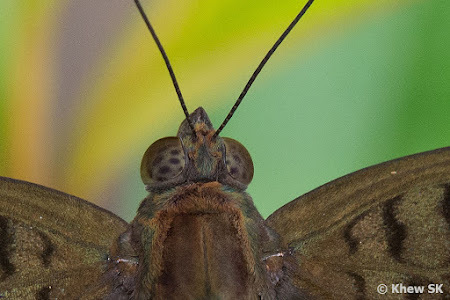 It would appear to be highly plausible in some species, where the proboscis is completely hidden by the labial palps until the proboscis is uncoiled for feeding. However, in other species, the size of the labial palps is not adequately large enough to cover even half of the coiled proboscis, leaving the proboscis exposed. 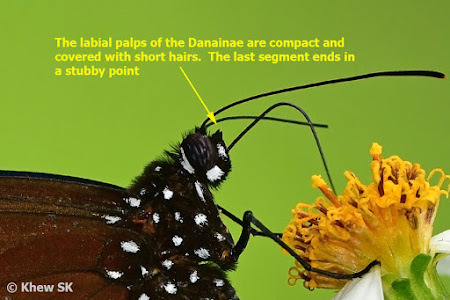 Another suggestion of the function of the labial palps would be that the long hairs covering the palps act as some form of filters and protect the eyes from being contaminated as the butterfly feeds at flowers or when puddling. 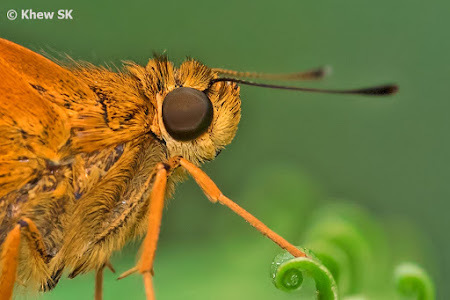 Again, the extent to which this may be true or not, varies from species to species, from the extremely hairy labial palps of a Satyrinae butterfly, to the smooth and more robust labial palps of some of the Nymphalidae. 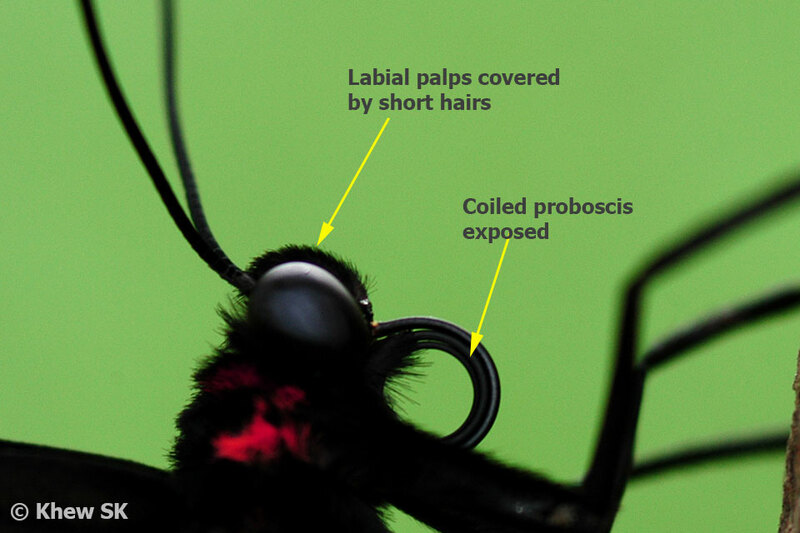 In field observations, one can observe the movement of the labial palps when the butterfly uncoils its proboscis to feed. 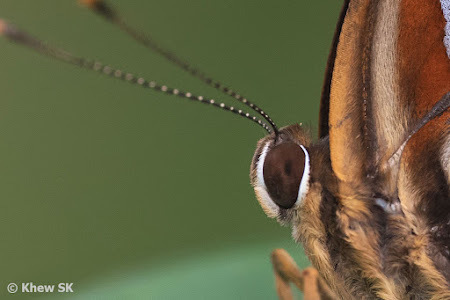 The muscles in the head of the butterfly appears to be able to control the antennae, proboscis and the labial palps independently but yet at the same time, coordinated enough to allow maximum efficiency for the butterfly to fulfil its primary objective to extract as much food source as possible when it feeds. The physical appearance of the labial palps varies quite a bit across the different families of butterflies. In some cases, the palps are short and plump and held closely to the head of the butterfly. In other examples, the palps are extremely hairy, whilst some are stubby and smooth. 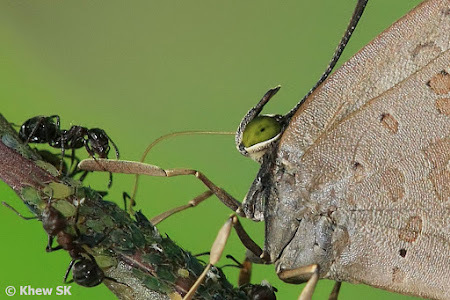 Some species have the last segment of the palps modified and stick out like a pair of horns, and some examples show the palps sticking rigidly and extending beyond the head of the butterfly like a snout. 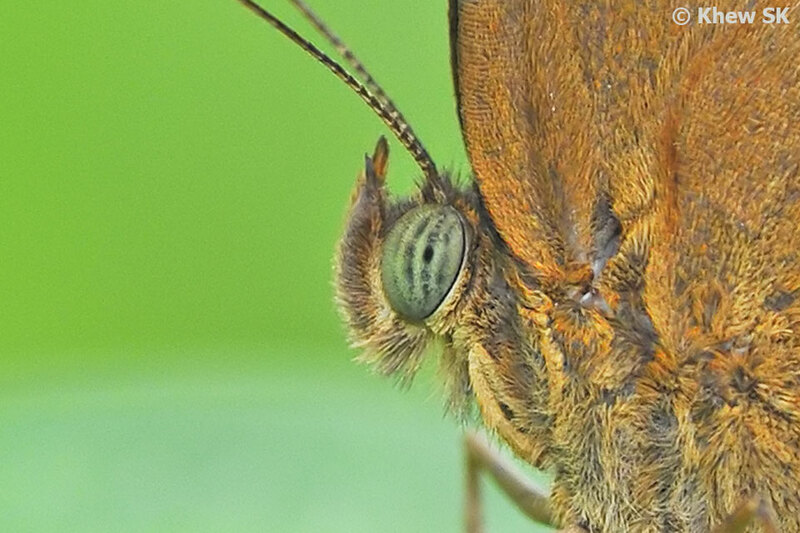 A unique example of the labial palps evolving into something remarkable in a butterfly would be the "Club Beak Butterflies" or "Snout Butterflies". 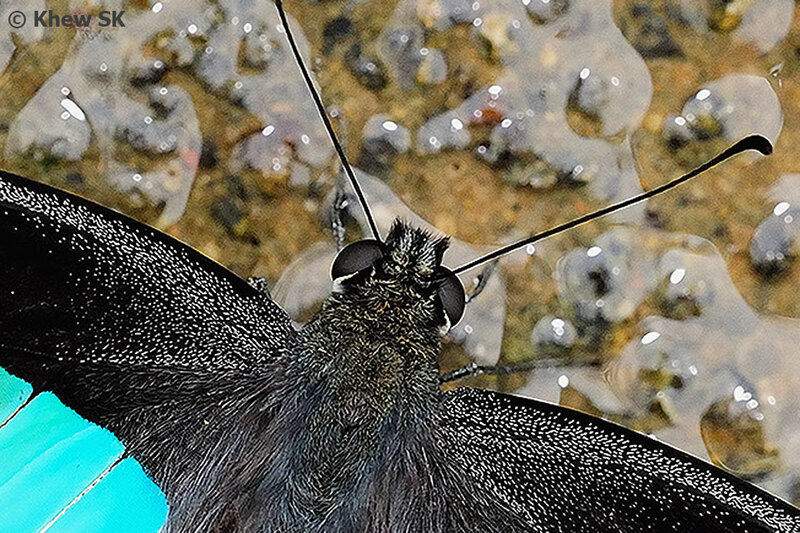 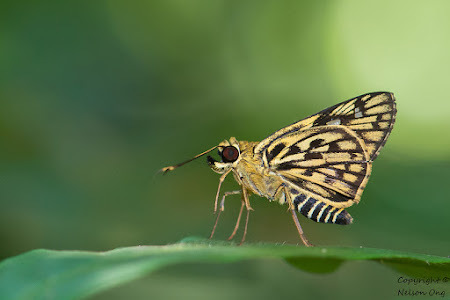 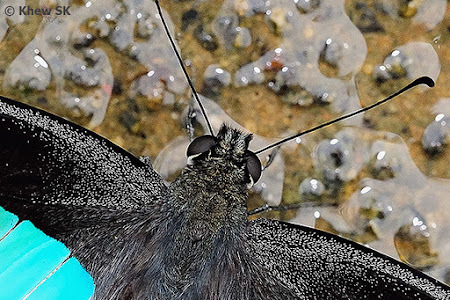 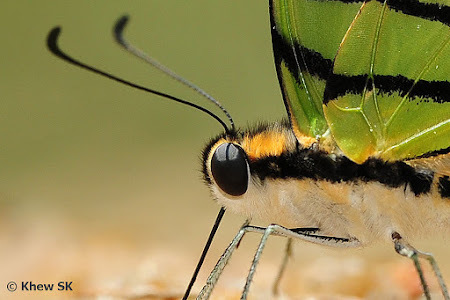 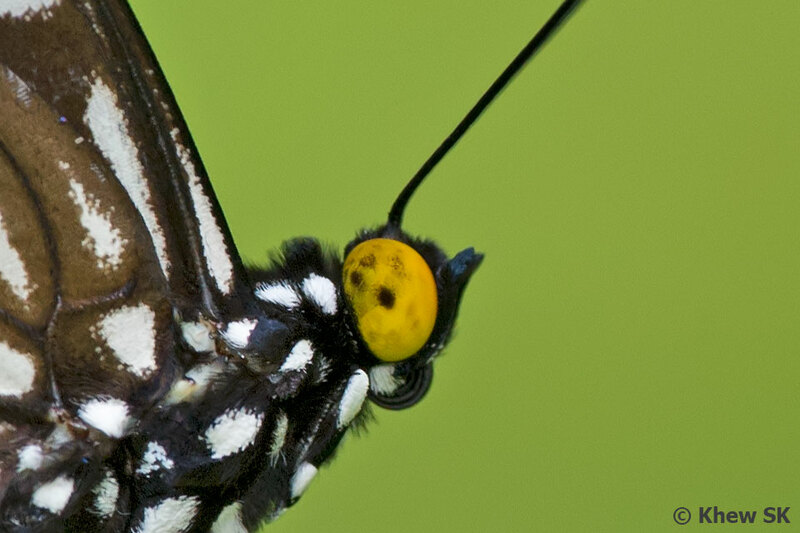 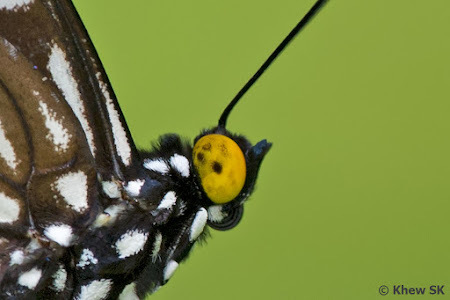 Although these species do not fly in Singapore, they are distinctive enough to be mentioned and shown here as an example of butterflies where the extended labial palps gives them an appearance of having a long snout. 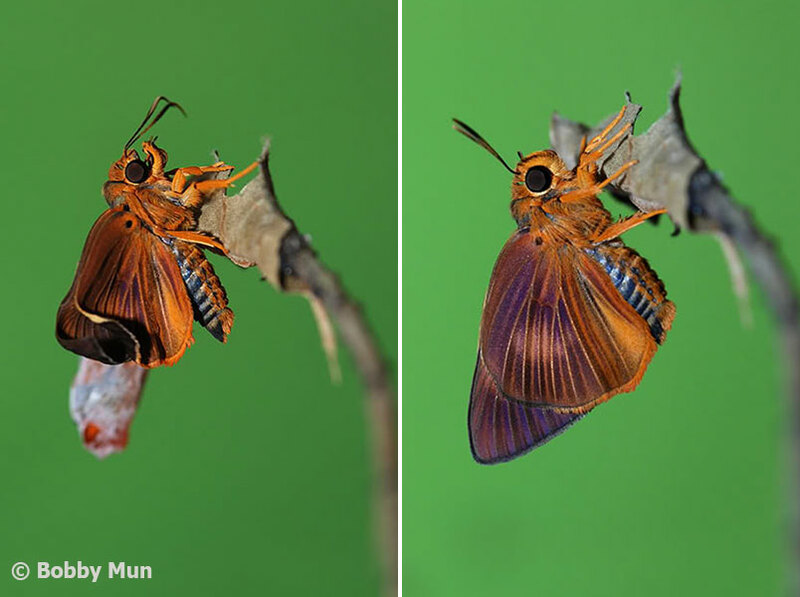 Let us now take a look at this examples of this morphological feature across the different species in the families that can be found here in Singapore. 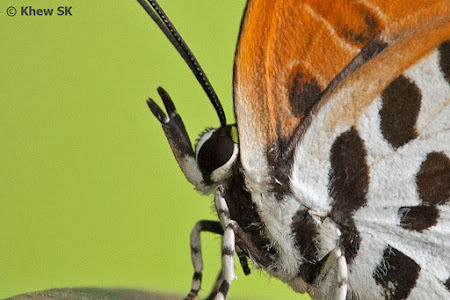 Amongst the large Papilionidae, it can be observed that the labial palps of the majority of the species in this family are compact and held close to the head of the butterfly. 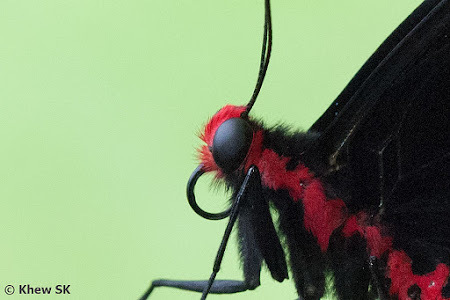 The hairs of the labial palps sometimes take on the bright colours of the butterfly's body, like in the Common Rose. 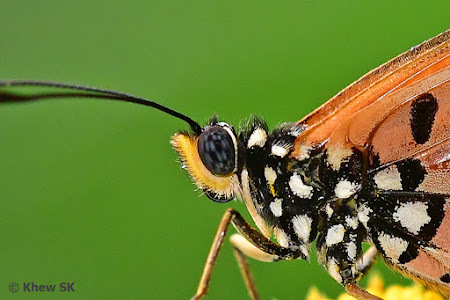 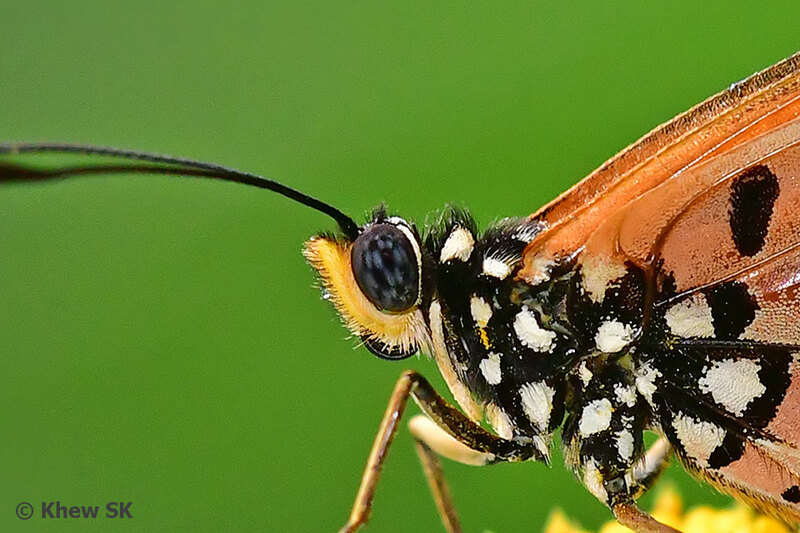 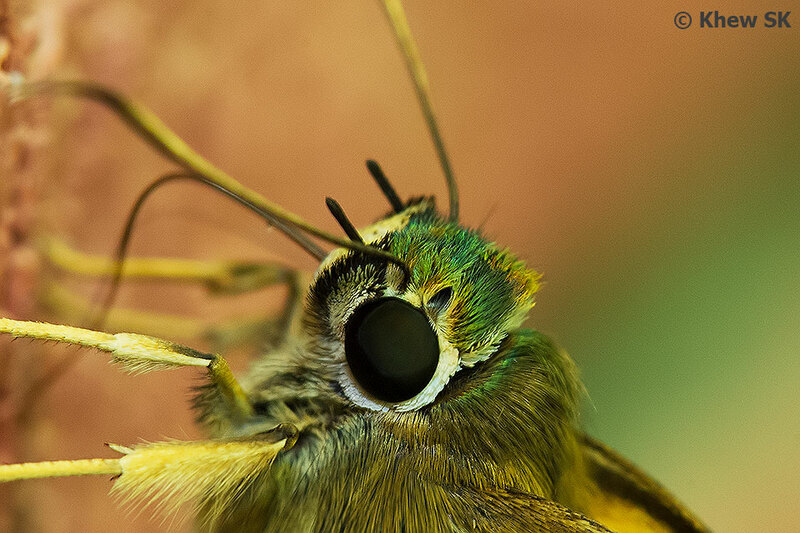 Given the long and thick proboscis of the Papilionidae and the comparatively compact labial palps, it is obvious that the palpi does not cover nor protect the proboscis at all, unlike some other butterfly species that we will see in the later part of this article. 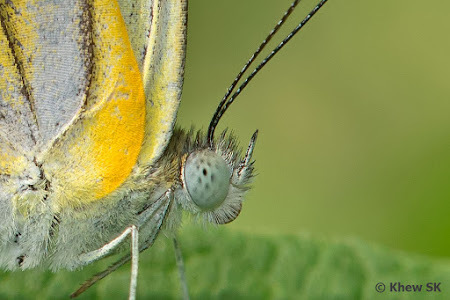 The sensory hairs on the labial palps are also short and thick and does not in any way extend out in front of the head of the butterfly. 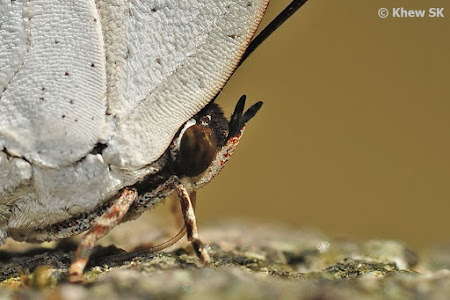 In the next family, the Pieridae, the labial palps are also compact but are generally covered with longer and thicker hairs. 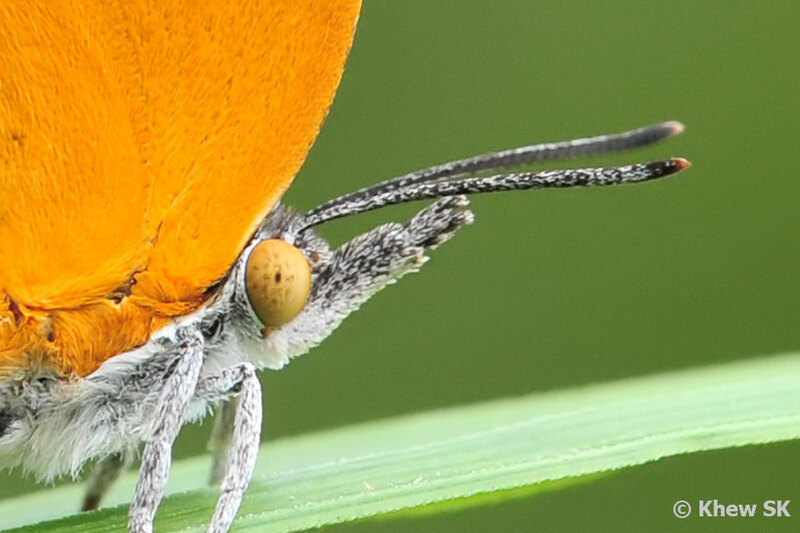 Species from the subfamily Pierinae have labial palps covered with longer hairs and the last segment of the palps ends in a sharp point. 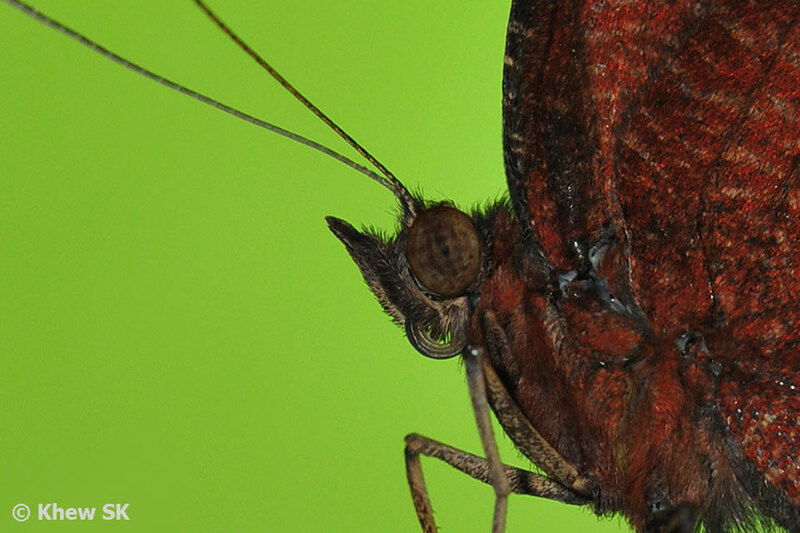 Species from the subfamily Coliadinae, however, have compact labial palps and do not have the last segment ending in a point. The large butterflies in the subfamily Danainae of the Nymphalidae family have compact and rather indistinct labial palps covered in short hairs. 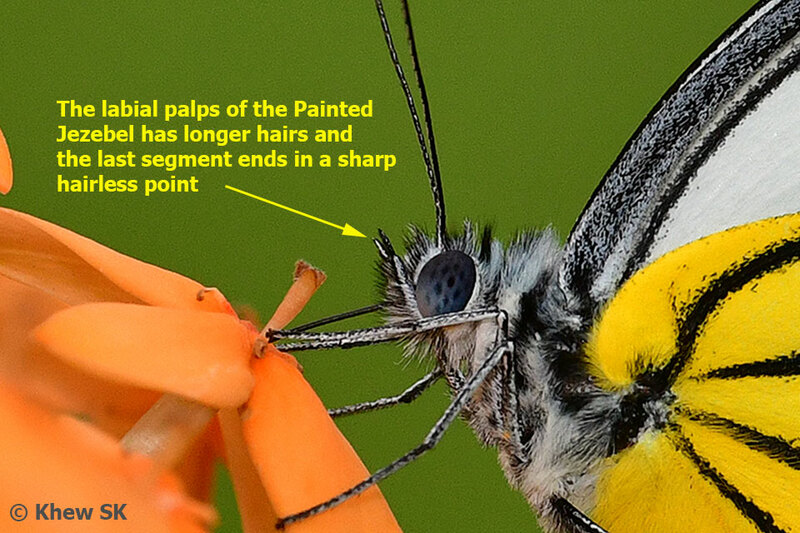 The last segment of the palps ends in a short stubby tip. 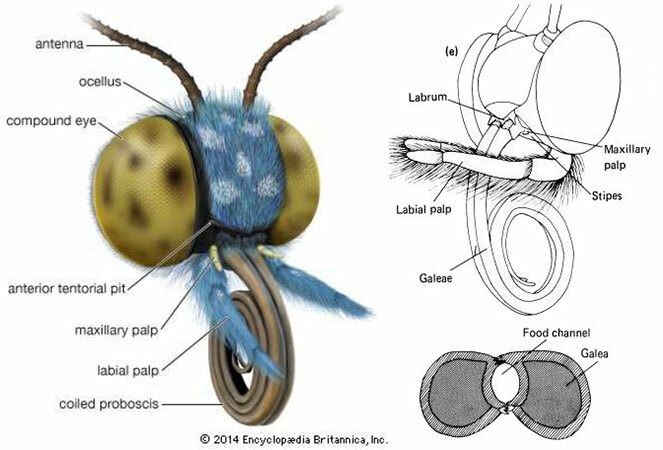 The compact labial palps do not cover the proboscis completely when coiled - the proboscis is partially exposed and extends beyond the labial palps. There is a wide variety of shapes of the labial palps of the several subfamilies of the Nymphalidae. 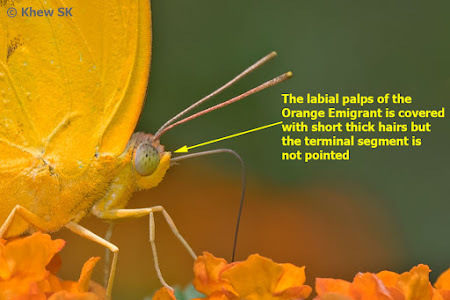 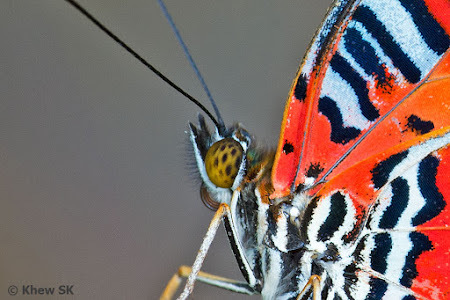 Some are covered in sparse and fine hairs, like the Malay Lacewing, whilst others, like the butterflies of the Baron genus, have short stubby labial palps that look like a beak when the butterfly is viewed dorsally. The genera Ypthima and Mycalesis features butterflies with exceptionally hairy labial palps, giving them an appearance of an unshaven face. 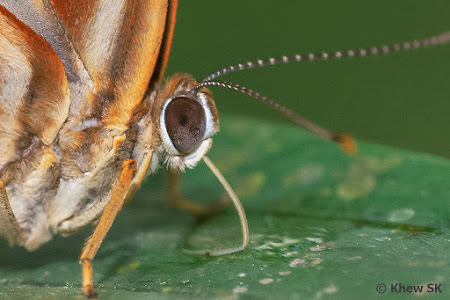 Of special mention are some species from the subfamily Satyrinae that feature exceptionally long hairs on their labial palps, giving the butterfly an appearance of an unshaven face. 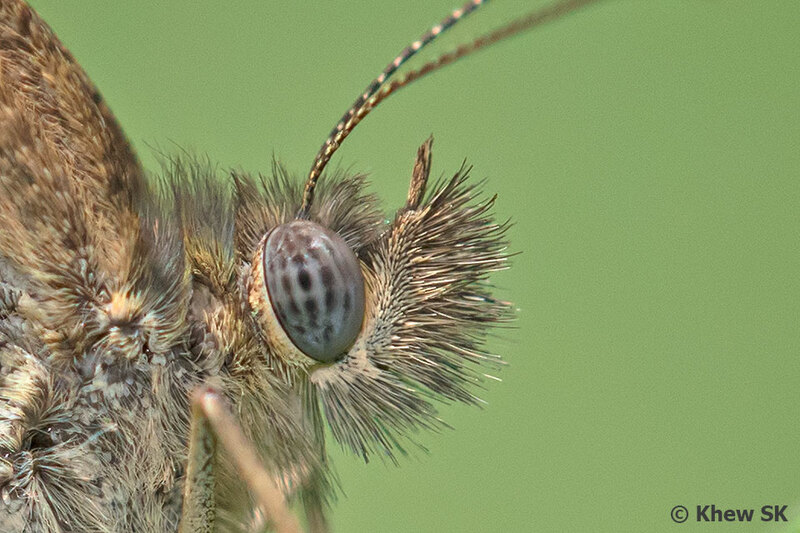 These long hairs on the palps completely hide the proboscis from view. The Riodinidae butterflies have very compact labial palps with very short hairs covering them. The palps are held tightly against the head and completely hide the short thin proboscis of the majority of the species in this family of butterflies. 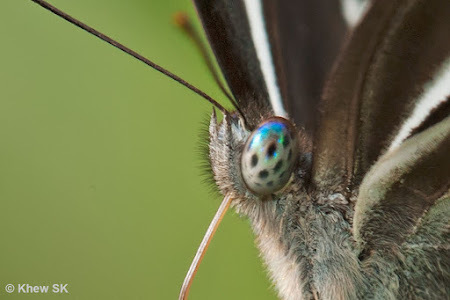 Amongst the Lycaenidae, the labial palps of many species have sharp distinct terminal segments protruding beyond the head. 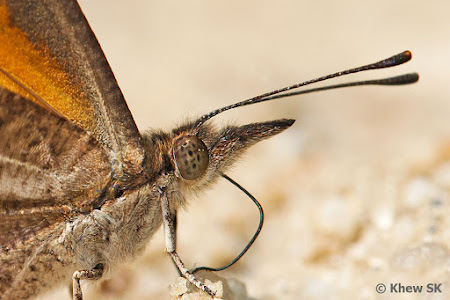 In some species, the extended labial palps give the butterfly an appearance of having a snout. 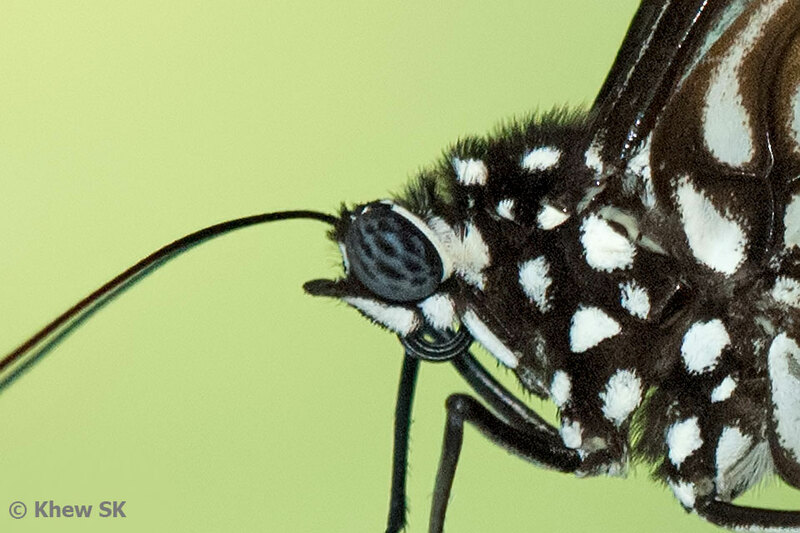 Species from the Curetinae subfamily have red spots on the palps and are diagnostic features for separating the species in the group. Species from the Miletinae subfamily have long, smooth labial palps making the butterflies appear to have a second set of short horn-like antennae from its face. The thin proboscis is hidden between the labial palps. 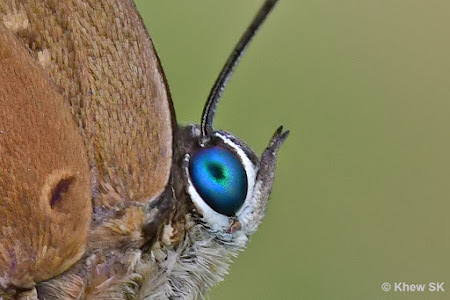 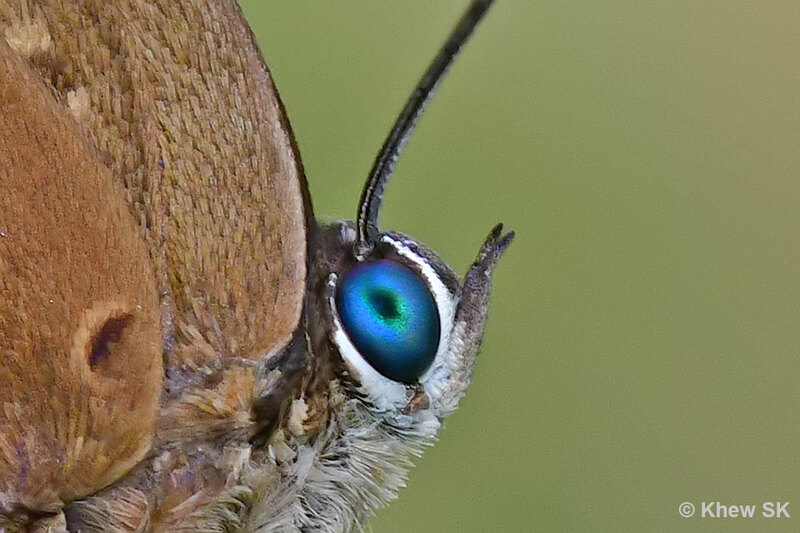 Other species amongst the Blues and Hairstreaks have labial palps extending way beyond its compound eyes and is prominently featured like pointed horns sticking out from the butterfly's head. 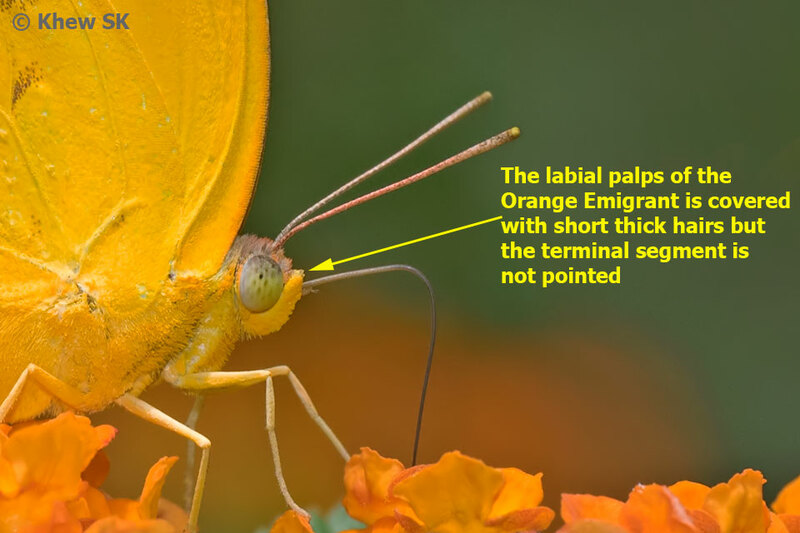 In several species, the labial palps are coloured distinctly. 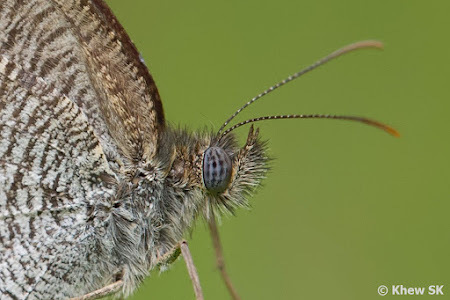 Finally, amongst the Hesperiidae, the labial palps of many of these robust-bodied species of butterflies are wide and covered with short thick hairs. 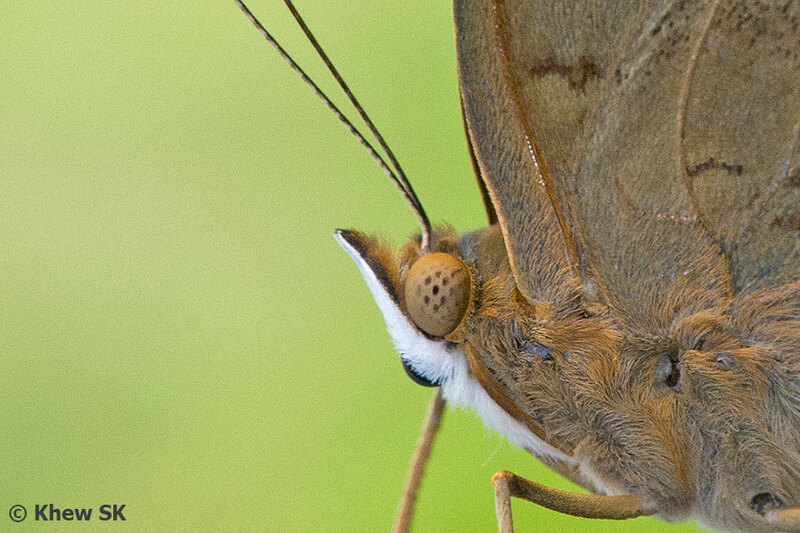 The terminal segment of the labial palps of several species from the Coeliadinae subfamily end in a short, smooth needle-like points emerging from the head of the butterfly. A unique behaviour amongst the Hesperiidae is that the butterfly can extend the labial palps beyond its face, pushing the palps forward in a remarkable fashion, making the face of the butterfly appear strange. 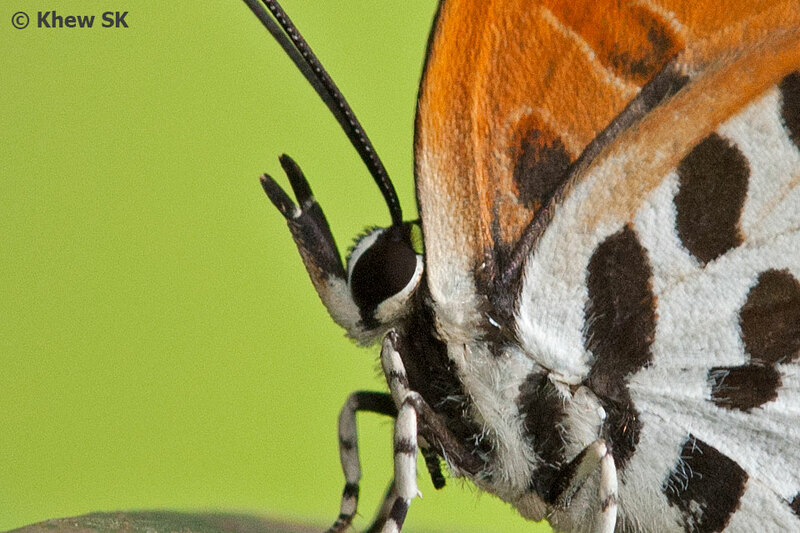 In newly-eclosed individuals, this behaviour is also sometimes observed, as the butterfly extends its labial palps. 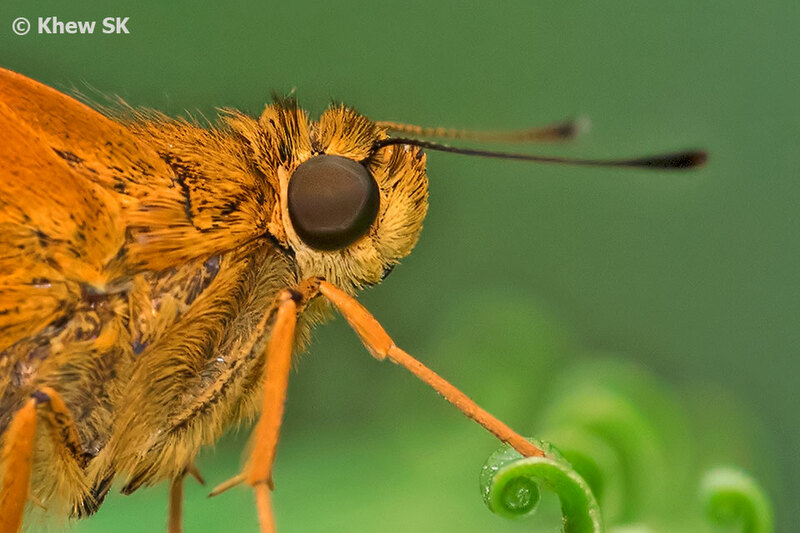 In the majority of species of Hesperiidae, the wide and significant labial palps are able to almost totally conceal the coiled proboscis. 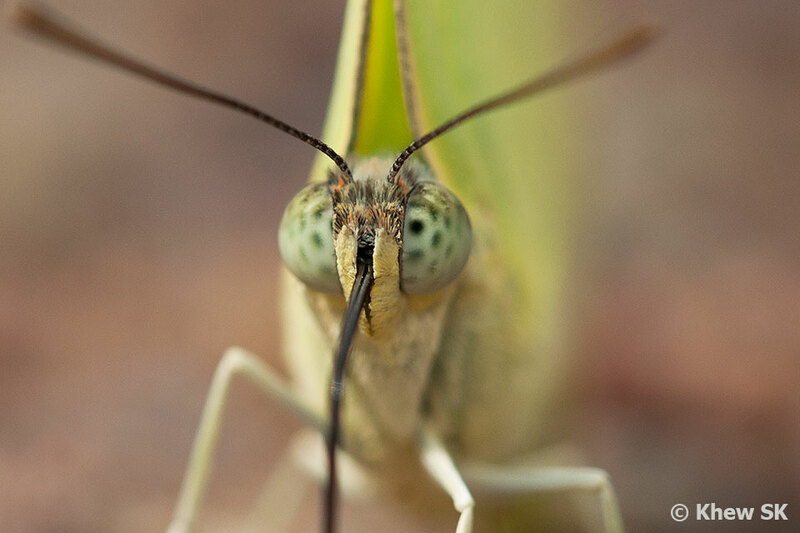 When you are out in the field next, do take a much closer look for this unique morphological feature in butterflies and share any special observations that you may have of the labial palps of butterflies.